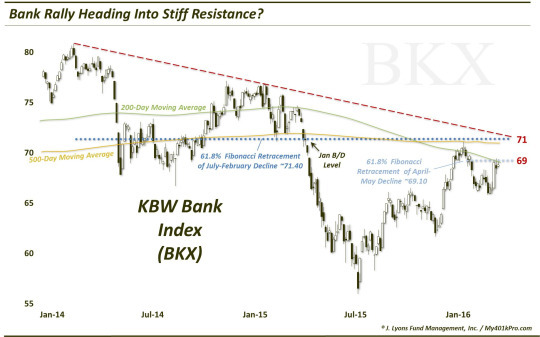 Bank stocks spiked on rate hike speculation; however, potential chart resistance suggests their upside may be limited. The big news in the markets this week was the release of the Fed minutes and the market’s interpretation that impending rate hikes may be much more likely than previously thought. Now we spend exactly 0% of our time and resources pondering what the Fed is going to do or say. All of the necessary information gets filtered through the markets anyway. However, in the short-term, obviously Fed-speak can produce fluctuations. The funny thing, as we have mentioned before, is that these rumors and resulting fluctuations have a strong tendency to occur when markets are technically in position to support such a move. For example, consider this chart we posted on Wednesday morning, prior to the release of the minutes. 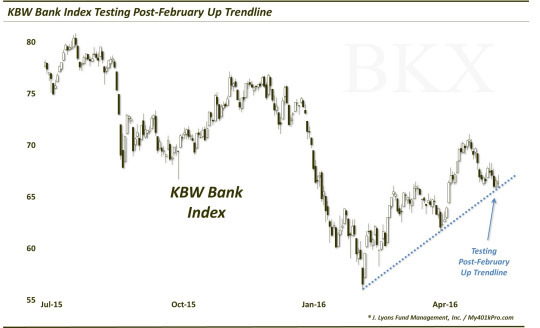 It shows that bank stocks, in the form of the KBW Bank Index (BKX), were hitting potential short-term support at the time, in the form of the short-term post-February Up trendline. Banks, as you may know, make up one sector that, on the margin (no pun intended), can benefit from rising interest rates. Regardless of whether this positioning led to the rate hike conjecture or not, banks were certainly in position to respond positively to the input. And respond positively they did, jumping some 4% to finish the week. Now, before you bankers and rate hike enthusiasts get too bulled up, from a longer-term perspective, the chart is sending the complete opposite message, in our view. That is, the BKX is approaching, or hitting, significant potential resistance. In our view, this evidence forms a potentially substantial challenge to the post-February bank rally continuing much further. If that is the case, and if our notion of rumors occurring when markets are technically set up to receive them is valid, then perhaps the message here is – don’t bank on an impending rate hike. Courtesy Dana Lyons' Tumbler (More Articles Here) More from Dana Lyons, JLFMI and My401kPro.